Greetings! 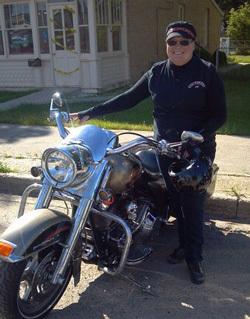 My name is Kathy Enders, founder of the ND Ladies Run (NDLR). I started my epic riding journey the summer of 1973. My husband, Roger, pushed me without the engine started on his 1965 Honda CL160 motorcycle around our back yard which had 95 trees. I then finally graduated to being pushed down the street and a few days later started the engine! WOW, I can do this! But what if I tip over? I came to a stop, tipped over, looked around to see if anybody seen me and proceeded to pick up the bike. I then purchased my first bike, a 400cc Kawasaki, and drove it home with only one mishap. Instead of going around the curve, I rode it down into a steep ditch without dropping it. Determined to ride efficiently and safely, I kept practicing and riding. We had two small children and if we wanted to take them on motorcycle vacations, I had to ride competently. At that time there were no motorcycle classes. Also, there were not as many women riders. It was predominantly a male sport. Now it was time to get my motorcycle endorsement. In the 1970’s there was no official driving test course. It was just pass/fail according to the officer’s discretion. I went to the police department in Tioga where I live and registered for the test. A lady friend of mine said the test was easy. All she did was ride down the street and turn left. The sheriff and her husband went and had coffee. I had practiced in the high school parking lot with the cones strategically placed. I could ride straight through, do the figure eight and lollypop turn, stop, and turn right or left. As I took the test, I demonstrated my riding skills and didn’t touch any cones. I felt good about my riding performance. The officer then informed me I had flunked because I didn’t look confident enough. So I kept riding, practicing and went again down to the Tioga Police Department and registered to take the test again. I took the skills test and once again didn’t hit any cones. I felt confident and good about my riding. I was informed that the officer felt my 400 Kawasaki was too big for me and failed me again! A month later I was registered to take the skills test again. I practiced 13 miles around my cone course the night before. I was prepared! I again went to our police department to take the test and many of the Tioga people were there watching. I left because I didn’t want to fail in front of everyone in town. My husband, Roger convinced me to go back and take the test. My legs and hands were shaking so bad because I had to perform in front of all these people I knew. A male friend was also registered to take the riding test. He hit several cones going straight, couldn’t do the figure eight without hitting all the cones, didn’t have to do the lollypop turn. It was then my turn to demonstrate my skills for the 3rd time. Again, I never touched any cones and had to do all the required maneuvers. My legs kept jumping as the officer said I passed and I looked confident. Personally I felt like that was the worse skills demonstration I had done. I then asked the highway patrolman if the man who just completed the test had passed. He said yes. I was angry that a man who wasn’t even able to go straight through the cones without riding over them had passed. I felt the highway patrolmen who had tested me were prejudiced against women. However, the ending result was better for me because I was forced into practicing. Every summer after that we took motorcycle camping vacations with our children on the back and then on their own machines. It was a scary and proud moment when I sat on the back seat of my daughter’s bike and she said “Mom, hold on and shut up”. Since I knew only a few women who rode, I felt the need to meet other women who enjoyed this sport. That was the beginning of the North Dakota Ladies Run in 1988. Nine women got together and rode from Minot to Bismarck. The Ramblers and Norseman Motorcycle Clubs showed their support for women riders by paying for our hotel rooms at the Holiday Inn. Since then the Ramblers MC have supported the mission statement and yearly NDLR event. This run is held the third full week-end in July at various cities in North Dakota, South Dakota, Minnesota and Canada. Ladies ride singly or in groups from their home towns to the run’s destination and are encouraged to camp or stay in motels for the week-end. Since this is an event for women so we can meet other ladies who ride, make the public aware that women ride and give courage to others who want to ride it is for women only-sorry guys. We have experienced the uniqueness of our own North Dakota and surrounding states and we have ventured into Canada. We feel the warmth and friendliness of each community. The scenery is beautiful on our ride to our destination. Every year there is at least one lady who says for the first time, “I can do this on my own!” As confidence is developed in riding skills and love for the wind (and rain) an inner peace and life determination is found. These are women of great strength and courage. Join us! Riding keeps the cobwebs out of your head. See pictures from our past runs! Register for the upcoming North Dakota Ladies Run. Click the button below for the registration page.